Another Facebook question I recently received was “Is Greek yogurt good for you?” The question was sparked by a recent post I did on “Foods You Thought Were Healthy, But Aren’t”, and one of the offending foods was Activia Yogurt. So today, I’m going to take you through the pros and cons of Greek yogurt and recommend how to buy it. 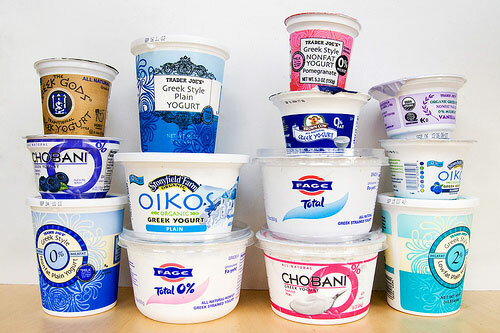 Greek yogurt is made by straining out the most of the liquid whey and lactose. This is why for some people (not all) that are lactose intolerant, they can still consume Greek yogurt without any issues. Because a lot of the lactose (milk sugar) is removed, there is a higher protein content, and lower carbohydrate content. One serving typically has 15-20g of protein. As a breakfast or snack food, I’m always advocating higher protein/lower carb so this fits the bill nicely. Depending on the brand you buy, if it contains “active/live cultures” then it’s also providing gut and digestion benefits. However, for this to hold, the label must read “contains” instead of “made with”. If you are eating your greek yogurt plain, unsweetened, and adding your own fruit, chia/flax/hemp, then GO YOU! However, if you’re buying the greek yogurt that has the berries or flavour pre added, then it’s no better than your every day Activia. Some of the flavoured yogurts have 18g+ of sugar. While there are still gut benefits to the probiotics in Greek yogurt, the quantities tend to be significantly less than something like kefir. This isn’t the end of the world, as long as you recognize you should be eating other fermented foods, or taking a probiotic in addition. Although a lot of the whey and lactose is removed, it is still dairy, and the form of protein, casein, along with residual lactose and whey can still bother many people’s digestion and in turn cause headaches, skin issues, etc. If you feel that you don’t have any of these problems, then this isn’t an issue.